I’m Cuppy, and I think these recipes are cuppylicious. I am a mom, wife, aunt, daughter, and sister. I enjoy cooking for any number of people, and I like it when my husband chops my vegetables. The soup in the Cuppylicious logo is my first ever attempt at Chicken Tortilla Soup. I researched for nearly a week to find the perfect blend of flavors in an attempt to imitate my comfort food experience at Las Palmitas in Coeur d’Alene, Idaho. It’s not Manuel’s, but it sure is tasty, and it’ll have to do until my next trip to Idaho. This site is made possible by WordPress, Comcast, and the most amazing pre-press man on the planet. 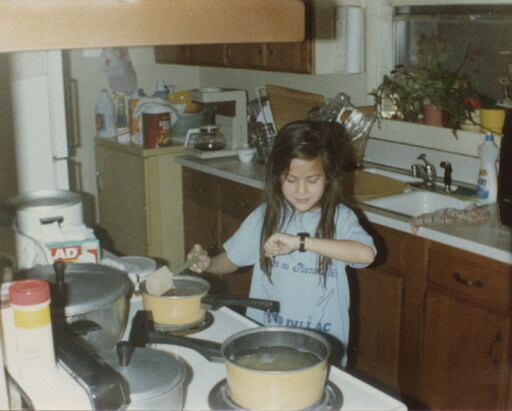 I began cooking at a really young age... and I'm standing on a stool.